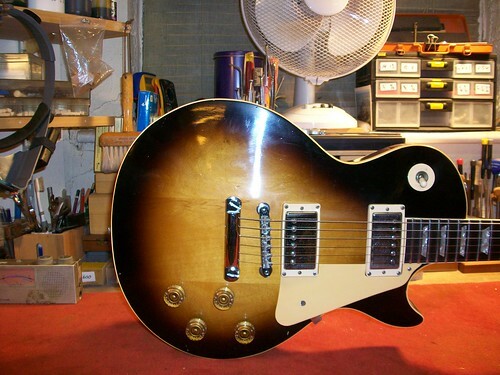 A while back I received an email regarding a Les Paul conversion. It was from someone stationed in Ascension Island. I immediately reached for my atlas to remind myself that Ascension Island is a remote island in the middle of the Atlantic Ocean. Well to make for an easy blog, I have enclosed the email verbatim. First things first… your website is amazing!! This e-mail is coming at you from sunny Ascension Island. It’s a British island floating between South America and Africa. I really hope you can help me with this. 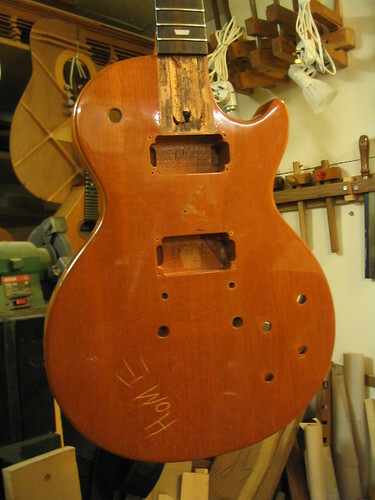 I’ve searched the internet for months for someone to do some work on my prized Gibson Les Paul Special. 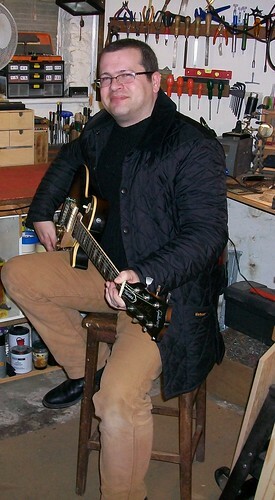 Ok, it’s not the grandest of the Gibson’s, but it’s the last guitar my father saw me play before he died. 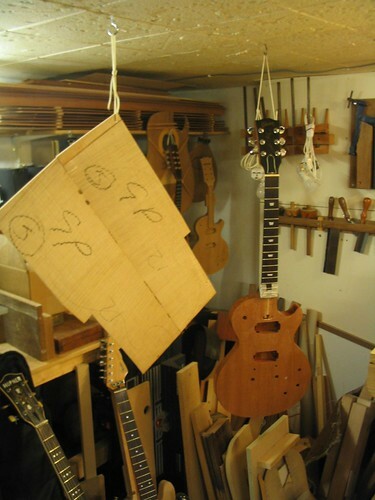 I saved for months to buy a PRS Custom 22, which plays like a dream, but I can’t connect with it like I do this one. I was going through a spell of home-sickness a few years ago when I was working in Oxford. It was my first time outside the south Atlantic (apart from vacations). 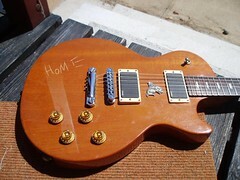 I foolishly carved the word “home” into the body of the guitar. I hated it the very next day. I’d like to remove the horrible carving. 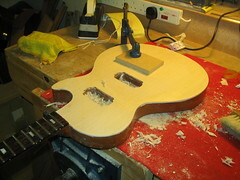 It’s less than 1mm into the finish, so it might be easy just to sand it down and re-varnish it (???). That’s my second choice. 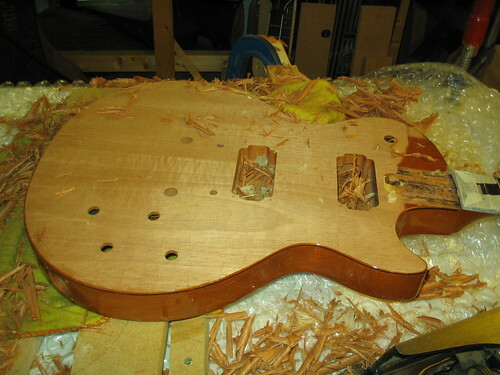 What I would really, really love is a flat maple top. 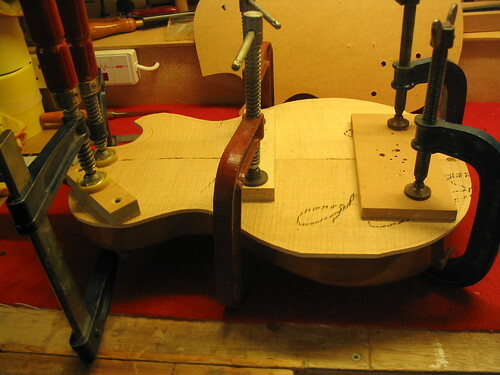 The Gibson Special is pretty much a flat plank, so it wouldn’t need any carving. 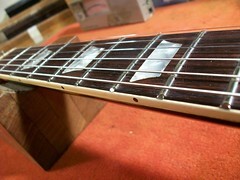 The only catch is that I’ve screwed a pendant between the pickups. My father gave me the pendant after a trip to Canada in 1989. If possible, I’d like to have a hole cut roughly to the shape of the pendant and then have it sit down in the wood. Is that possible? I’ve attached some pictures so you can see what I mean. I upgraded the guitar to Zakk Wylde EMG’s a few years ago. I’ve found them too harsh for the sound I want. 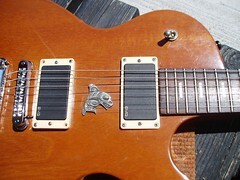 I’d like to downgrade to the Gibson stock pickups and install a Fishman Tune-O-Matic powerbridge. 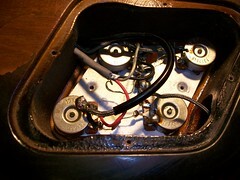 The power-bridge would need a powerchip to control the blend, but I’d like to re-wire the pickups to 1 – tone / 1 – volume and have the other two pots dedicated to volume and blend of the Fishman. I hope I’m not asking anything impossible, but please let me know if I am. I feel really guilty for what I’ve done to this guitar and now I just want it fixed. I’m not too worried about the cost or how long a project like this would take. We have access to the UK post system here, so mailing to and from you should be pretty easy. Failing that, I can always hand carry it over on a flight and then have a friend in the UK collect it when it’s done. 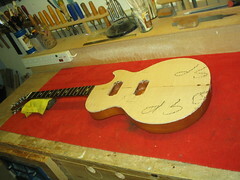 After several email exchanges and a few phone calls I accepted the challenge and the guitar was shipped over to the workshop. Work started soon after. 3way selector to switch between them. soon as this stage is completed I can start spraying. With the spraying completed the electronics were assembled and wired up. Several other jobs were also carried out. Well, my guitar played its first gig last weekend. It performed brilliantly!! The sound is outstanding and it really does play like a dream. Activating the peizo was a great way of finding out who played guitar in the crowd… just look for the people with jaws down to their knees!! I ran it through an acoustic simulator pedal and an EQ pedal with a touch of delay. It sounds so similar to my Takamine plugged… FREAKY!! I love it!! The magnetic pickups are so smooth. I can create so many tones on this guitar without actually touching my amp or effects rig. I’m spoilt for choice. 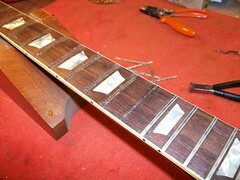 Besides the tonal difference, the sycamore top makes the guitar vibrate more when I’m playing it. It’s like I can FEEL the guitar sustaining when I play. Thank you so much for the work you’ve done. 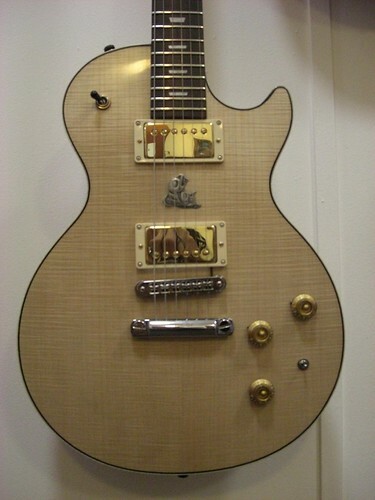 All of my friends want this guitar (even a couple who can’t actually play!!!) My PRS is now my backup guitar!! Haha! It’s Barry from Ascension here. 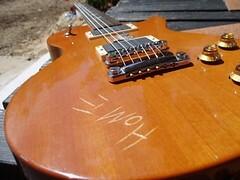 I just wanted to say that the work you did on my Les Paul still turns heads. 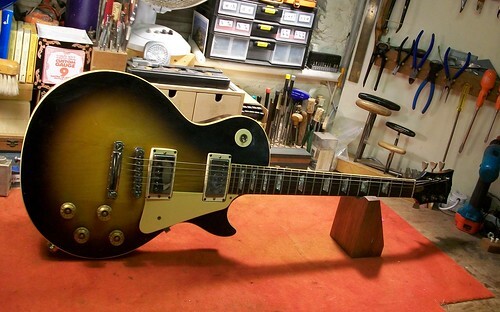 It’s not a Les Paul anymore. 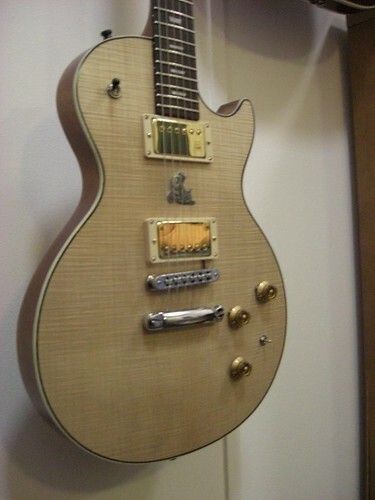 I don’t think Gibson had anything like this in mind when they designed the Les Paul SL. 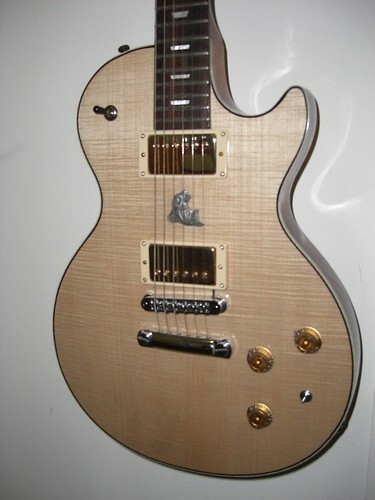 It’s no longer a budget guitar with mid range pickups and basic finish. 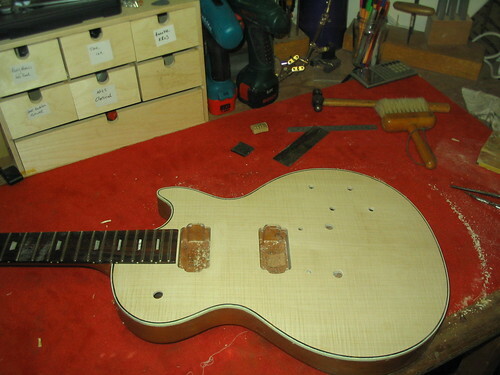 It’s now a one of a kind guitar with a combination of aged Humbuckers and Acoustic Piezo’s with a custom shop finish. I’ve been using a stereo cable for the Fishman signal. The blend of PA acoustic alongside a Vox AC30 (original I scored from an old relative for £200) is amazing!! I’m getting the tones I need directly from my amp and PA without the need for stomp boxes between. Well, apart from my trusty Crybaby. 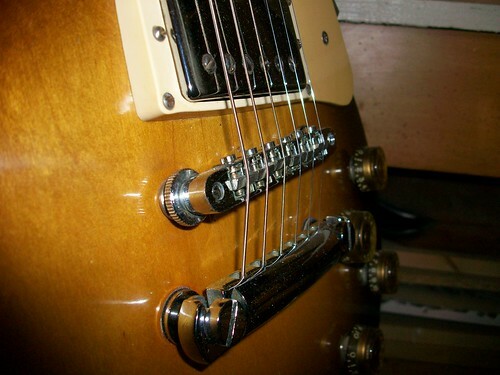 As for the pure tone of the Humbuckers, it’s slightly glassier than a standard Les Paul. It’s really bright with the volume knob backed off a quarter turn. Wack the volume up to 100 percent and it beefs up like old brawler. Another perk to the work you did was the new top you installed. 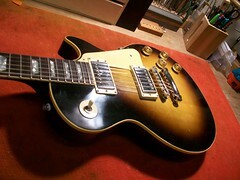 I played a deluxe high-end Les Paul just the other day and I couldn’t believe how lifeless if felt. My guitar resonates so much that i can feel the vibrations through the body. It’s a nice feeling when everything is loud and obnoxious. Every guitar should feel like this. 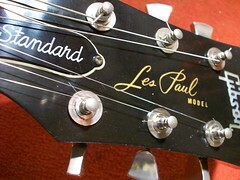 Thanks for making my budget Les Paul a masterpiece. I never thought I’d call my PRS Custom 24 a backup guitar.